Selecting and using the right socket - 7-pin or 13-pin plug? When you are considering purchasing a towbar, you will have to decide whether you will connect it your car with a so-called 7-pin socket or with a 13-pin socket. Which socket you choose, depends on how you want to use the towbar: a bike carrier, trailer, caravan, boat trailer or horsebox? Or a combination of several applications? Every object that you attach to your car, has to be powered by electricity so all the lights are working. An essential feature that ensures safety in traffic. 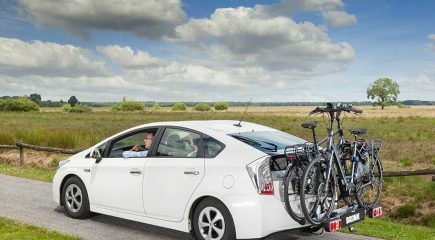 The connection between the car and the bike carrier, trailer, caravan, boat trailer or horsebox is created by putting the plug of the object you wish to tow in the socket on your car. The two plugs that are most common are the 7-pin and 13-pin plugs. In general, bike carriers are equipped with a 7-pin plug. The same applies to older trailers, boat trailers or horseboxes. In more modern models of these tow objects, the 13-pin plug is more and more common. A caravan always has a 13-pin plug. The difference between a 7-pin and 13-pin plug is that a 13-pin plug has more functions. A 7-pin plug only supplies in basic lighting, such as blinkers and brake lights. Perfect for bike carriers. The additional pins in the 13-pin plug are used for the reversing lights and the rear mist light, among other things. Ever since 10 July 2011, both functionalities have even become mandatory on trailers, caravans, boat trailers or horseboxes, which is why they nowadays have been equipped with 13-pin plugs. The other additional features are geared towards caravans and provide power to the inside lights, battery back and fridge in caravans. Having this information already makes it a lot easier to determine whether you need a 7-pin or 13-pin socket with your towbar. Of course, it may be that you want to transport both a bike carrier and a trailer, caravan, boat trailer or horsebox. Then the Multicon-West socket is an option. All benefits of a 13-pin plug are also present in the Multicon-West. What’s more, this socket can also accept 7-pin plugs. One drawback is that the Multicon-West socket has not been standardised and in practice can lead to difficult situations. It may be that the combination of a 7-pin plug with a 13-pin Multicon-West socket can result in water or moisture entering the socket, which cannot get out. The result: corrosion and bad electric contact. We recommend that you select a properly standardises 14-pin plug if you want to transport both a bike carrier and a trailer, caravan, boat trailer or horsebox, as there are adapter cables and plug adapters available to connect a 7-pin plug to a 13-pin socket. These plug adapters are also available to connect a 13-pin plug to a 7-pin socket. It is advisable to always remove the adapters after use. Otherwise, water will run into the socket via the adapter that cannot get out. Plugging in the plug in the socket of the car is different for 7-pin and 13-pin plugs. A 7-pin plug can simply only be plugged in one particular manner. Pay close attention to the small indent on the bottom of the plug. It is a little harder in a 13-pin plug. This will have to be twisted into the socket. The plug contains a small cube at the bottom, which can only be put in the bottom of the socket. In doing so, the plane on the 13-pin plug faces to the left. Subsequently, the plug can be twisted into the socket by turning it clockwise 90 degrees.